This is what I have to look forward to now that I will be Kyle’s coach. This is a live action shot of his team during one game from 2 seasons ago. Points of interest from this picture: Note the goalie not paying any attention to the game. Also note the coach tying one kids shoe, during the game. Yes, that is Kyle with his shirt pulled over his head. Does anyone see the ball in this picture? I’m going to have fun. Why not just allow your whole team to practice celebrating!! Spend a couple of practices with them Celebrating Goals!! Everytime they score in practice make them celebrate... Kyle has this down to a tee already... let him lead the charge!!! wow, I can't even imagine what this team will be like? with all of your quirks man are they in trouble!!! You will have a team full of flower picking, snack eating, running the wrong way, scoring in the wrong net, bunch of kids!!! Kyle's got 6 pack abs. Do you? 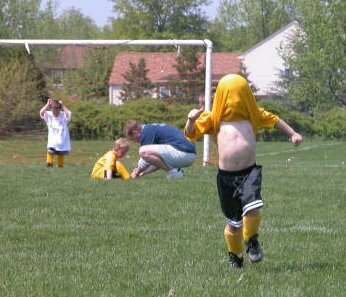 What made him put his shirt over his head like that? That's awesome! He looks like a fun kid. And here I was thinking I was the only soccer parent who had to constantly tell her son to "put his damn shirt down before he gets knocked in the head with the ball." I am glad I am not alone in this. that is absolutely hilarious. tooooo cute. Gosh I remember playing t-ball at Kyle's age, I used to sit inthe outfield and make daisy chains...the ball came out my way and I stood up threw it back and yelled "Im busy here"..
Whisperer, look at it this way...while with the soccer kids, and coaching,you won't have to worry about the triple d's. Sunlight, grass, happy kids, and a soccer ball. Fun fun fun! Only you could find stress in that! Try to find the joy in the moment. No D's to contend with...there's a positive!!! Great use of the camera, by the way! Gotta save those priceless moments! OMG this is my life now. Today, I finally had to explain to Evan that he doesn't have to score or win, but he at least has to TRY LOL. He just loses focus on the game all the time, or the other team gets the ball and he just gives up instead of trying to take it away. They're having fun, getting exercise, and making friends, so it's still a success for the most part! Today, the other team only had two players, they let them play anyway, and the other team still kicked their skinny little butts. Good times! when i was that age my mindset was to score as many goals as possible and knock down all the other kids. now i am the leading scorer on my travel team. just think kyle could be like the crazy bash brother in might ducks but he is playing soccer. i love the sport u should learn to.